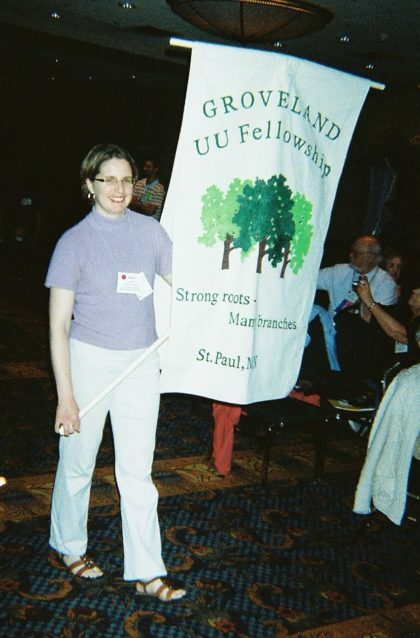 Sara Leiste carrying Groveland’s banner at the Prairie Star District Conference in 2008. 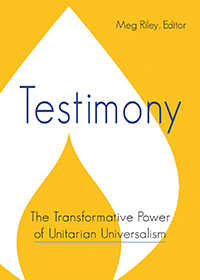 Celebrating its 25th year in 2017, Groveland Fellowship is a small, urban community of Unitarian Universalists. Our lay-led congregation of 25 – 30 members offers a variety of topics at our Sunday Services. Our members come from different backgrounds, but all enjoy how we share our thoughts and life experiences when we meet on Sunday and in other congregational get togethers. Many life-long friendships have been formed here as we learn from our Sunday speakers and from each other how to find those things in life that are most valuable to us and how to help make life better for others in the wider world. Come join us for a Sunday service or one of our other events. We would like to meet you. We hold services from the Sunday after Labor Day through the Sunday before Memorial Day. We take time off from Sunday services during the summer, but still meet for book group, potlucks, congregational meetings and other events.